I love cheese, I mean a real cheese fanatic! So when I discovered a cheese you could fry without all the hassle of breading and deep frying. I'm there! This is a perfect weekend snack. Okay...It's good any day of the week. Let it get a nice golden color before you turn it. I know...how can you tell it's golden until you turn it. Well let it fry on medium heat for a couple of minutes, it will release fairly easy once it starts to brown. Turn it on all sides, watching it the whole time so it won't brown too much. When you remove it from the heat place it on a paper towel to absorb some of the excess oil, if any. Serve it with salsa! It has a slightly salty, mild flavor. Crispy on the outside an nice and soft on the inside. Perfect for snacking! It also tastes good with your favorite fruit preserves. Hope you enjoy it! We did. Maranda liked it too. We were able to sit outside and enjoy the warming weather, while snacking on cheese. I also tried my hand at Korean Sushi. It tasted great but I still need to work on the presentation. I'll keep you posted on my progress! The fried cheese sounds and looks divine! I'll have to search for that one at our grocery store. What is Korean about the Korean sushi? I've never heard of this before. Mmm cheese. I'll have to look for that kind. I have sauteed Gouda once, but it was lightly breaded. It was so yummy. The sushi looks good too. One of these days I am determined to try sushi. wow, the fried cheese looks so tempting..and the sushi looks so perfect..loved the clicks. Sassy - Korean sushi is made with a lot of veggies and has egg and rice noodles, no raw fish. Japanese sushi is usually simpler with a few items in it, sometimes with raw fish. The dipping sauce is different too. Korean sushi doesn't usually use wasabi, and is a little sweeter. Kristy - thanks, you are too kind. I didn't attend the class I just watched them make it, and did buy the pickled daikon radish and rice noodles there. Mine is still not right I put the rice too far where it wrapped in the nori. I am thinking of taking a Korean cooking class, when there is an opening. They have it weekly. Michelle - I tried frying the cheese before, but sliced it differently and it didn't crisp up as well. This sushi is easy to try, my daughter even likes it. Deepa - Thanks so much!! I've never had Mexican frying cheese, but I've had the greek one called haloumi. I just adore it. Fried cheese... drool. Good stuff. oh cheesy goodness right there!!! This looks perfect for a party and you could almost call it diet food because there are no carbs. The fried cheese looks great and the sushi too. Must try to make sushi one of these days! H H - I've had the Greek flaming fried cheese called Saganaki before! Opa! Gulmohar, Chow and Chatter, thanks you two. Devon, that's right!, no carbs, and I only used a tiny bit of oil, and salsa is veggies! Cheah - Thanks, you must try sushi, there is something for everyone! Fried cheese! Love it! I've never fried Mexican cheese though, don't know if I can find it here, but I'll look. I was drooling at your description. I've never had fried cheese and I suddenly feel deprived.....these cheese sticks look fantastic! Ditto for the sushi! Glad you liked my brussels spouts! They are great as beer snacks, you sushi rolls looks good too! What a fabulous idea! This would be a heavenly snack! I have had this before, I used to have a friend from the Dominican Republic and when I went to her families on holiday her mom would make this. They always called it "tropical cheese" and would often roll it in a bit of flour for a nicer crunchy crust. I have been trying to find some of this cheese in Kalamazoo Mi. I want to make some! These cheese look amazing! I do not know if I can find it here in Sweden, but I will check, especially for my husband who is a real "cheeselover"! My wife and I just discovered this product and found it a great, low carb snack (if you're avoiding carbs). I was inspired to try something. Greek restaurants serve a fried cheese dish called Saganaki, where the cheese (firm feta I believe) is pan fried, then splashed with Uzo (a Greek liquor), and set ablaze. Here, I pan fried the cheese, as above, and before removing from the pan, I splashed about 1 to 2 ounces of Tequila, and lit it with a BBQ lighter until the flames subsided. 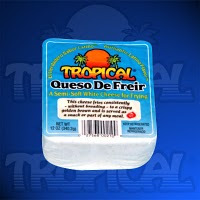 I removed the cheese, served two fingers on a warm corn tortilla, sprinkled with lime juice and kosher salt. Absolutely delicious. Enjoy.